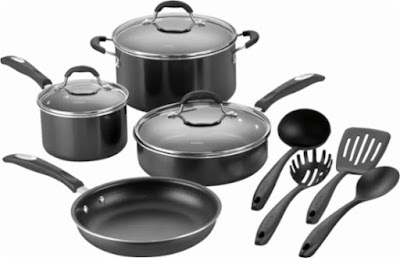 Today only, while supplies last, get this Cuisinart - 11-Piece Cookware Set for ONLY $49.99 (Retail $199.99)! Whip up meals quickly with this Cuisinart nonstick cooking set. With 11 pieces, including four pans and a skillet, this set is ideal for cooking soup stock, searing meat and sauteing vegetables, and the four kitchen tools add versatility when preparing pasta or turning eggs. The triple base layers of the pots in this Cuisinart nonstick cooking set provide excellent heat conduction.